Every 76 years, Halley's Comet makes an appearance in the night sky. Here are ten facts about Halley's Comet. Halley's Comet is named after the astronomer Edmund Halley (1656 - 1742). Although the comet is named afer him, he didn't actually discover it. Instead, he believed that a comet that he observed in 1682 could be the same comet that had been observed in 1607 and 1531. He believed that comets actually orbit the Sun just like planets and that the comet he had seen would return in about 76 years later if it was to follow the same pattern. It returned in 1758 as he predicted. Although he had died by the time this happened, the comet became known as Halley's Comet. Halley's Comet takes 75 to 76 years to complete an orbit around the Sun. Comets travel in elliptical orbits, usually going from a great distance away from the Sun (hundreds of millions of miles) to relatively close (just a few million miles) to it. As the get closer Sun, they begin glowing is the Sun burns off its particles. This makes them visible from Earth, and every 75 to 76 years, as Halley's Comet approaches the Sun, it becomes visible in the night sky, looking a bit like a smudged star. The most distant (aphelion) that Halley's Comet gets from the Sun is 35 Astronomical Units. One Astronomical Unit is the approximate distance that Earth is away from the Sun, which is about 150 million kilometres, or 93 millions miles. So 35 Astronomical Units is 35 times Earth's distance from the Sun. This is almost as far away as Pluto is away from the Sun. The closest Halley's Comet gets from the Sun (perihelion) is 0.57 Astronomical Units, so its gets closer to the Sun than Venus, the second closest planet to the Sun. Because Halley was able to predict the reappearance of his comet, scientists and researchers have been able to go through ancient astronomical records to find other observations of the comet. The oldest record of a comet which is likely to be Halley's Comet is from 240 BC by the Chinese in a chronicle called Records of the Grand Historian. 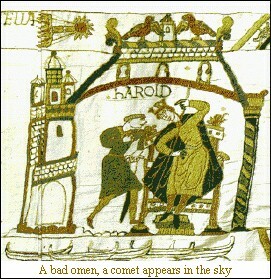 Halley's Comet appeared in the Bayeux Tapestry, an embroidery depicting the events of the Norman invasion of England and the Battle of Hastings in 1066. As the comet seemed to appear from nowhere, people believed it to be an omen. The tapestry shows one of King Harold's attendants telling the King of the appearance of the "comet star" stating that it is a bad omen, possible a sign of God's wrath for King Harold unrightfully claiming the English throne. 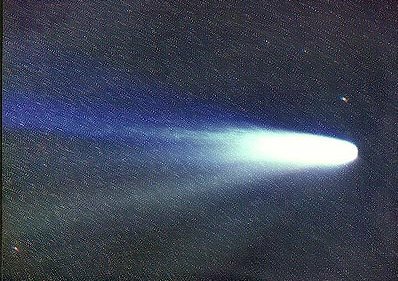 It has sometimes been speculated that Halley's Comet is the Star of Bethlehem that the Wise Men saw around the time of the birth of Jesus. Records of Halley's Comet appearances suggest it was observed in 12 BC, but a record of another possible comet was made in 5 BC. This second object appeared in the same place for seventy days with no movement recorded, as if hovering over somewhere, quite possibly Bethlehem. Halley's Comet is darker than coal, and reflects only 4% of the sunlight it receives. It only shines brightly when it is close enough to the Sun for its dust and vapours to be burnt off. Halley's Comet is shaped like a peanut and is about 15 kilometres (9 miles) long, and 8 kilometres (5 miles) wide and thick. American writer Mark Twain was born on November 30th 1835, two weeks after an appearance of Halley's Comet's. In his biography, he stated that he was born with Halley's Comet, and is likely to die with it. Mark Twain died on April 21st 1910 - the day after Halley's Comet reappeared. Halley's Comet's most recent appearance was in 1986 when it was photographed close-up by Europe's Giotti space craft and Russia's Vega 1 and Vega 2 space crafts. Its next appearance will be in 2061.